It was one of the most exciting moments to watch during the PyeongChang winter Olympics: the cross-country ski race is almost finished and Jessie Diggins begins to make her move. When she pulled ahead of the leader, viewers all over the U.S. stood up in their living rooms and cheered for the Minnesota native as though she could hear their support. The announcers had just explained that at this point in the race, the racers’ bodies were exhausted, but Jessie found something extra in the tank helping her dig deeper, push harder, and cross the finish line to clinch the gold medal. 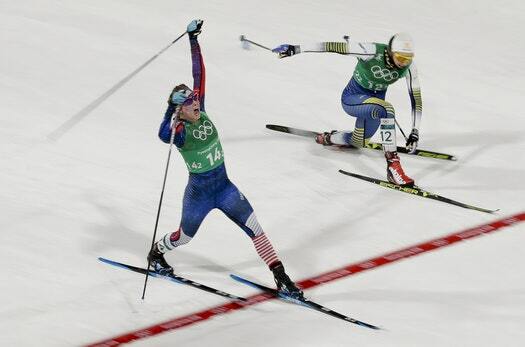 Diggins and her teammate, Kikkan Randall, brought home the first ever cross-country gold for Team USA. The announcers screamed “HERE COMES DIGGINS! HERE COMES DIGGINS!” and it will undoubtedly go down as one of the best Olympic finishes for years to come. Soon, kids all over the country will ask their parents for a pair of cross-country skis. In fact, the sport is such a fantastic workout; the whole family could take some inspiration from Team USA and clip into the skis together. 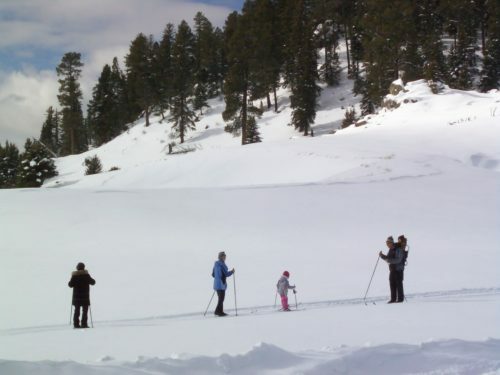 One of the things that makes cross-country skiing an ideal activity for the whole family is the fact that you don’t have to be in Olympic shape to do it. Whether you’re training for Team USA glory, or finding a way to get the kids off their devices for an afternoon, cross-country skiing is an awesome way to get outside during the cold winter months. Cross-country skiing combines upper body and lower body movements and engages muscle groups you might not even know you have. By incorporating both pushing and pulling movements while maintaining balance and rhythm, your arms, legs, core, glutes, back, and more stay actively engaged and working to propel your body through the terrain. We all know it’s more fun to be active with friends and family. Because cross-country skiing movements are intuitive, it’s easy to get started at a very young age, making this an ideal sport for the entire family. 3. It makes you more physically fit. 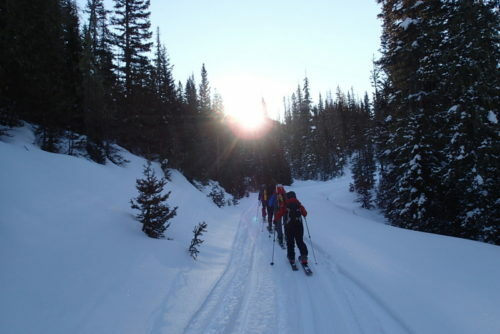 Cross-country skiing is a uniquely effective workout, and skiers on average tend to be more physically fit than other athletes. Combined with diet, cross-country skiing can be one of the best ways to get in shape quickly. Seriously. Cross-country skiing burns more calories than any other form of exercise—up to 1,122 calories per hour if you’re really getting into it (Diggins style). The gliding motion used is less stressful on joints than running. Because it engages so many muscle groups, no single group is over-exerted and you can maintain the activity for longer periods of time. With sustained activity over a longer period of time, this sport improves cardiovascular endurance. When you’re skiing, your heart maintains an elevated rate—essentially training itself to be more efficient at pumping blood. 7. It helps with other movement. The intuitive, gliding motions are fully in-line with the way our bodies are designed to move. Sustaining those movements and building up the variety of muscle groups engaged can improve the way we move in other aspects of our life—from improved posture to better running form and even balance. 8. You can do it year-round. Ok, cross-country skiing is usually associated with winter, but there are modified skis with wheels to allow for warm weather training. That said, warm weather offers a variety of possibilities for outdoor exercise, but during the cold winter months when curling up on the couch is tempting, cross-country skiing is a great option! The sport allows a peaceful, tranquil way to connect with nature and get away from the hustle and bustle of every day life. Spending time immersed in nature is crucial for emotional health and managing stress levels. 10. It’s an excellent form of cross training. Even if you’re not going to be the next Jessie Diggins, cross-country skiing over the winter can help you get in shape for spring and summer sports. Engaging all those muscles throughout the colder months will improve your body’s ability to manage lactic acid produced by muscles during a tough workout. Grab the family and hit the trails! Many park departments offer ski rentals and manicured trails, and there’s no time like the present to get started on this wholesome to the core activity.